/What is a dental implant? 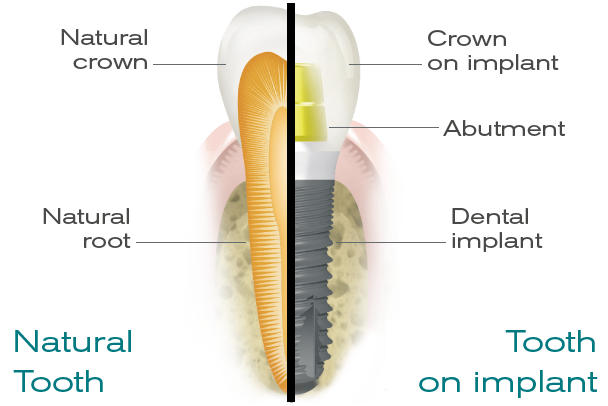 Implant treatment consists of replacing the root of a lost natural root with an artificial root. This artificial root supports the prosthesis without using the adjacent teeth, which are therefore preserved and kept intact. Dental implants can be placed into the jawbone to replace one or more teeth. They can also be used to replace a removable prosthesis (dentures) with a fixed prosthesis. /What are the benefits od dental implants? What are the benefits od dental implants? Since they are fixed firmly into the jawbone, implants feel the same as natural teeth and allow you to eat normally. Since they leave the palate totally free, implants let you speak naturally. A dental prosthesis fixed onto an implant looks almost identical to natural tooth. Implants let you smile, laugh or yawn with no discomfort, without running the risk of showing the hooks or metal parts of other prostheses. Dental implants have been shown to be a proven technique with an extremely high success rate. If you practice good oral hygiene you can keep your implants for many years.